If you’re anything like us, you value your website visitors and customers. After all, they’re the reason for your success. If they don’t feel inclined to keep visiting your site or doing business with you, your conversions and sales will likely take a steep dive. This is where starting up a loyalty program can be immensely useful. By rewarding your customers directly for their continued interest in your brand, you can make them feel more appreciated while increasing your own profits at the same time. In this article, we’ll introduce you to loyalty programs and explain why they’re such an effective tool. We’ll also discuss how you can begin your own, and talk about what you need to know before doing so. Punch cards not required. Chances are you don’t need much of an introduction to loyalty programs. You may even have a loyalty card or two in your wallet right now. As it turns out, the concept isn’t much different whether you apply it to a physical coffee shop or a website. Ultimately, the goal is to make customers feel like they are members of an exclusive club and reward them in a way that encourages them to keep coming back. The idea of using this type of loyalty marketing is actually centuries old. Back in the late 1700s, merchants used to give out copper tokens to customers, which they could exchange for other products later on. In some ways, this is not far removed from how a lot of loyalty programs work today. By giving a customer reasons to come back to your store, as well as incentivizing repeat purchases, you create a positive feedback loop. The more they spend, the more they get rewarded, encouraging them to make even more purchases. This works out in everyone’s favor, as you get more business and your users are recognized for their continued patronage. There are a number of ways to apply this formula to websites. 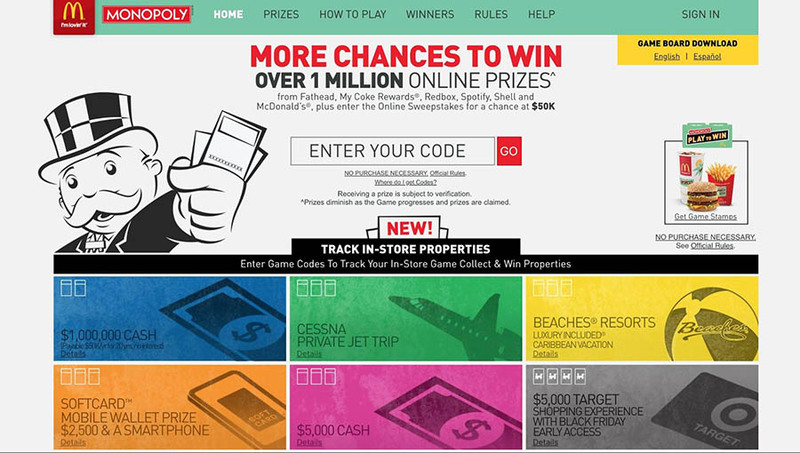 The classic token method is one option, or you could implement a points program to ‘gamify’ your site. We’ll look at these and other techniques later in this article. Retain your customers more productively. By offering rewards, you can give users a tangible reason to keep coming back to your site and making repeat purchases. If you’re running a small business, customer retention is critical. Provide genuine value to your customer base. A loyalty program can help make customers feel appreciated, as they are rewarded with gifts, premiums, additional content, and so on. 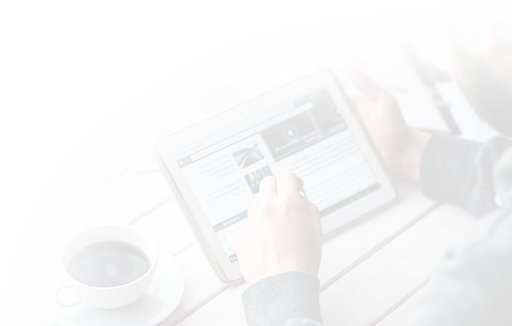 Increase the likelihood that customers will refer your site to their networks. If you build a strong relationship with your current users, they’ll be more inclined to recommend your site to others, increasing your profits in the process. Word-of-mouth marketing is an important tool to have in your arsenal. Make your business more desirable to consumers. By making the benefits of long-term loyalty to your small business clear, it can appear more welcoming and appealing to newcomers. Save money on marketing to existing customers. Loyalty programs are often cost-effective measures, which can be very easy to maintain over time. While we’ve talked a lot about “customers” so far, it’s essential to note that customer loyalty programs are not just for stores or other commercial websites. You can run a successful program for any business or website where you want to encourage your users to act in some way. 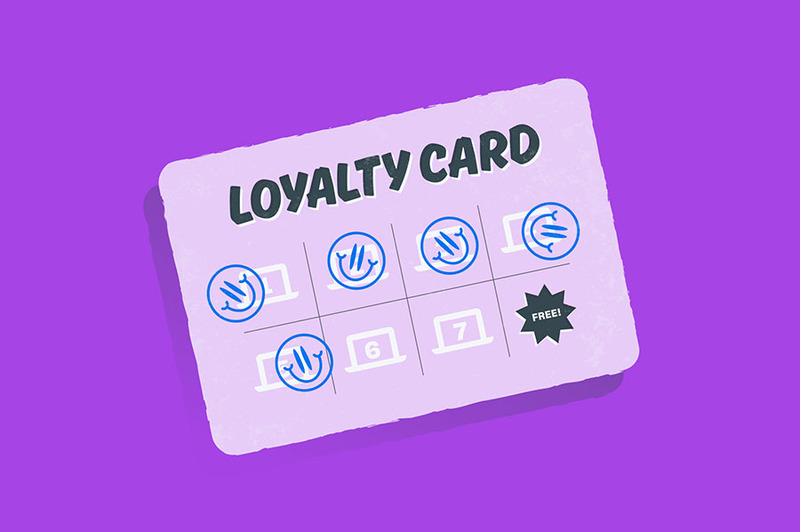 What’s more, there are many different types of loyalty programs you can model yours after. Let’s take a closer look at some of the best options. Loyalty programs can come in many shapes and sizes. As such, the first thing you need to do before starting one is to decide what type of program you’d like to run, and what would suit your website best. In fact, you can even combine aspects of different kinds of programs, to create something completely unique. Determining what type of rewards system you want your program to focus on is the most critical consideration, as it will change everything about how you design it. To provide you with some inspiration, let’s take a look at a few of the most popular types of rewards systems. This is the type of customer loyalty program you’re most likely already familiar with. These programs give users loyalty points when they perform specific actions, most commonly completing a purchase. Those points can then be exchanged for gifts, discounts, or other non-monetary rewards. One notable example of this in action is Nintendo’s rewards program. 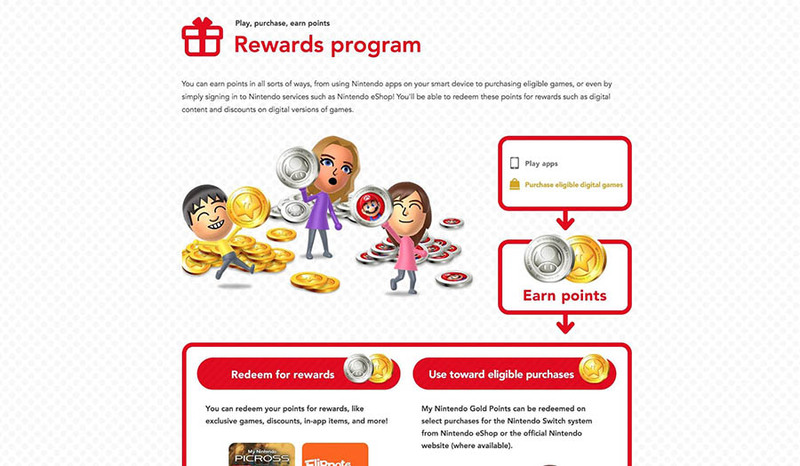 Nintendo uses a system where users can earn points both by buying products and by simply playing the games they’ve bought and connected to their accounts. The company also offers two different types of points, which can be exchanged for various physical rewards. Not only does this reward users for spending money on Nintendo products, it actively encourages them to play the games they’ve purchased. This is an excellent example of how a loyalty program can be beneficial to both business owners and the customer, and can also promote long-term engagement. Turning your website into a game might seem drastic, but it’s become a very popular way to engage with visitors. In a sense, gamification is the newer cousin of the points program. Users are not just rewarded for certain actions, but they are actually able to progress in some way. For example, such a system could contain ‘levels’ or ‘tiers,’ each of which grants permanent privileges when a user reaches it. Arguably one of the most famous examples of this in action is the McDonald’s Monopoly game. This is an annual event where McDonald’s customers can collect game pieces, which they can exchange for free food items, or save up to potentially win bigger prizes. Pieces also vary in rarity, giving customers a reason to keep coming back and spending more. That way, they’ll increase their chances of completing a set or finding a rare piece. If fast food isn’t your thing, you may instead be familiar with the system used by Stack Overflow. On the Stack website, you can earn reputation and points by performing specific actions that are helpful to the community. As your reputation grows, your level increases, which grants you access to new privileges. In other words, this program incentivizes and encourages helping out the community. Users who put in the effort are rewarded with more insight and tools. It’s not just businesses and users who can have mutually beneficial relationships, as this next type of program demonstrates. A rewards partnership is a program where two (or more) brands collaborate to provide rewards to their respective users. We’ve already seen one example of this with the Monopoly game, which is a collaboration between McDonald’s and Hasbro. However, there are many ways you can use this type of program to your advantage. For example, two companies could each reward their loyal customers with products or services provided by the partner business. This can be particularly useful for businesses that have limited interaction opportunities with customers, such as insurance companies or banks. An excellent example of this is the partnership between Spotify and Starbucks. 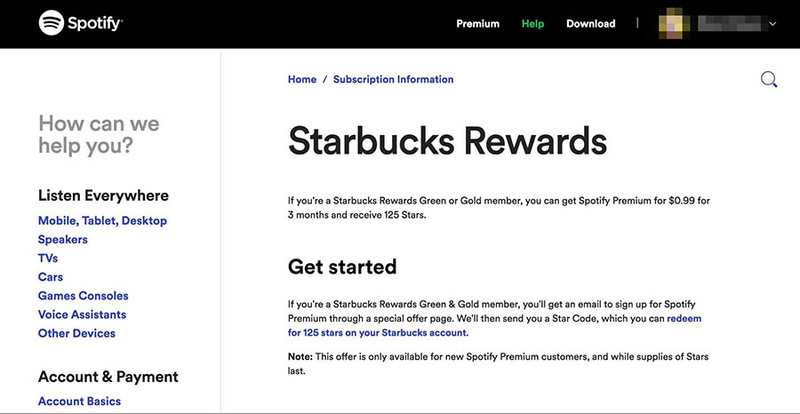 As part of this program, Starbucks Rewards members can get Spotify Premium with a significant discount. If they do sign up for a Spotify account, they’ll also get rewards points they can use at Starbucks, creating a ‘virtuous circle’ and great customer experience. 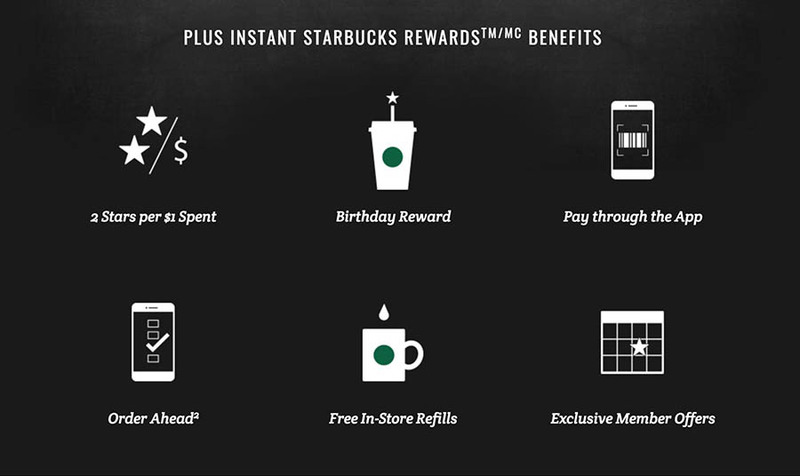 Finally, you can use a loyalty program not just to benefit you and your users. You can also leverage it to help underprivileged people. You can do this by implementing a charity-based program, where the rewards take the form of donations and other charity efforts. 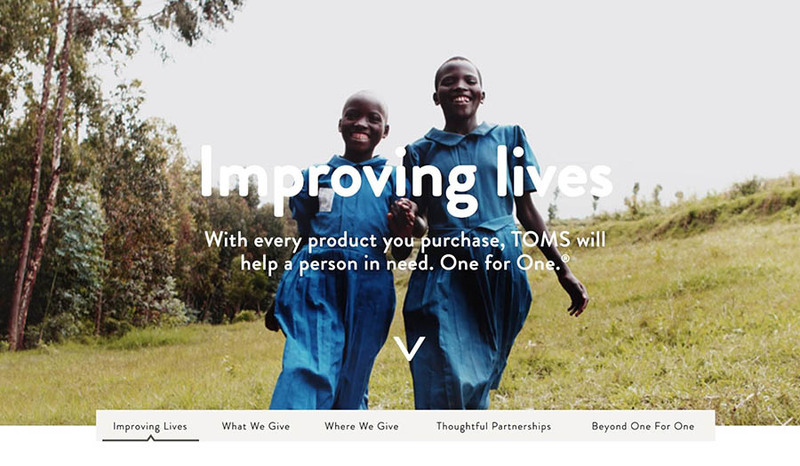 For a glimpse into how this can work, take a look at the Improving Lives program from TOMS. This footwear brand helps many charitable causes as a direct result of purchases made by customers. Every time somebody buys one of its products, a share of the profits will go to providing clean water, shoes, and other types of support to various regions all over the world. This type of program is an excellent use of a brand as a positive force in the world. What’s more, it builds trust in your business and may make people more likely to want to work with you. As you can probably imagine, setting up and implementing a loyalty program can be a complicated process, no matter which variety you opt for. To help you get started, we’re going to walk you through the basic steps of how to create a loyalty program and share some tools that can speed up the process. When starting any loyalty program or rewards club, it’s a smart idea to come up with a name that communicates its purpose immediately. In the same way that choosing a strong domain name benefits your website, giving your program the right moniker is vital. The most important consideration is to be descriptive. Clearly tie the name in with your brand, but also make the purpose of your program obvious. Sometimes this can be as simple as a name like “Starbucks Rewards,” but you can also get creative. For instance, framing your program as a ‘club’ provides an added layer of trust and commitment. This is a way to take a simple rewards system and turn it into a community, where dedicated members are rewarded for their ongoing loyalty. 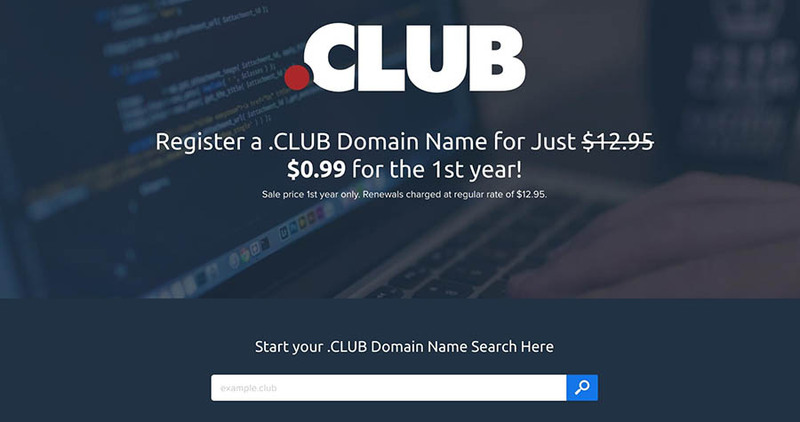 To really make an impact on users, you can even get a .CLUB domain for your rewards program. This can help to connect your program with your brand, while also making its purpose clear. Whether you have a dedicated website for your loyalty program or a section of your current website devoted to it, having a custom domain for your loyalty brand makes it easier for your customers to learn how to participate. For example, the watch company Swatch has a “Swatch Club” loyalty program, and the domain www.swatch.club points to the section of their website that is all about the club. If you do require a separate domain and hosting for your loyalty program, you’ll also want to be sure and select a high-quality hosting plan. We’ve already outlined some of the ways you can implement a loyalty program. The method you decide to use will depend entirely on your ultimate goals. To put it simply: What do you hope to get out of the program? You’ll need to consider this question carefully if you want to find the solution that’ll work best for you. For instance, if you want your program to merely increase the number of repeat purchases, a simple points system is probably enough. This will encourage users to come back multiple times after their first order. However, as we covered earlier, that’s just one way you can use a rewards program. 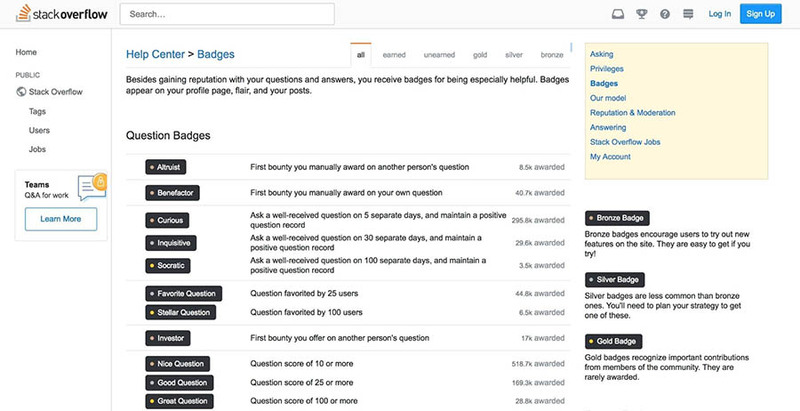 For instance, the Stack Overflow program we mentioned before is essentially a way to crowdsource community management. It provides next-to-no financial incentives to users, but it helps them get involved in the community while letting the site keep its support costs down. In short, you need to know what your program’s ultimate purpose is, so you can find the solution that will work best to achieve that goal. Feel free to look at the examples we outlined earlier, and use them as inspiration for your own plans. Once you know what your program’s focus is, you can start to think about rewards. You can consider this stage as effectively being the practical application of the previous step. You’ll need to consider who you’re targeting with the program, and what you want to encourage them to do. Then, you’ll have to present them with a variety of rewards that align with your users’ values. Depending on your brand and intentions, this could be exclusive content, special deals, early access to new products, and much more. A key part of this step is making sure the rewards you offer are well defined and visible on your site. For instance, the Boots store clearly displays the monetary value of the points you can earn by purchasing individual products. This will not only inform your current members but will also serve as an advertisement for your program. By making the benefits of your rewards program clear, you’ll encourage new users to sign up. Last but not least, signing up to your program needs to be as easy as possible. After all, you’ll want to place few barriers between your users and your program. Fortunately, if you’re using WordPress, this becomes significantly easier. That’s because WordPress can actually take care of the registrations for you, if you have the right tools. For instance, you can use a plugin to apply the features of a loyalty program right onto your existing site. One example of this kind of plugin is myCRED. This tool adds a scoring system to your site, and each registered member is automatically assigned a point balance. You can then specify which interactions should reward users with points, and how many they’ll get. Another plugin that does something similar is Gratisfaction. This plugin adds a fully-featured loyalty program to your site, enabling you to set up just about any scoring or rewards system you’d like. Once again, it uses WordPress’ built-in user system, and simply layers the loyalty features on top of the platform’s existing functionality. This is a much quicker and simpler way to implement a rewards program than designing one from scratch, while still remaining flexible. Maintaining a positive and lasting relationship with your customers couldn’t be more critical. The best way to do this is to make them feel valued and appreciated — as if being your customer makes them members of a special club — which you can accomplish by implementing a loyalty program. This lets you reward your loyal customers for taking desired actions and can also lead to increased profits for you in the long term. Do you have any questions about loyalty programs, or how to build an effective one? Join our DreamHost Community or hit us up on social media to chat about it!